The Association was created on June 1996 at Constantine, the capital of Eastern Algeria and has the statute of a Wilaya based cultural, educational, and scientific association. The actual Web site of the Association, although in continual gestation (and hopefully improvement), was created in early 1998 as part of a personal Web site of a founding member of the Association (Chaouki Boulahouache, and may he be thanked here) who has gone for graduated studies at Syracuse University. It was then taken over to the Geocities location when Internet reached Algeria in late 1998, and was totally overhauled in the process. It can thus truly be said, as claimed on the main page of our site (Perhaps a little bit immodestly), that it is the first Algerian scientific /astronomical /cultural site based in Algeria as far as our knowledge goes. In fact, we are only aware of another significant Algerian astronomical site, namely AR-RASSED from the city of Tenes in Western Algeria. 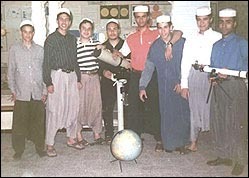 >> Some Sirius members during a Saharian observation trip at the invitation of Al-Kutb Astronomy Association from Berriane (Mzab region), and wearing the traditional clothes of the area (For a larger view, click on the picture). If there are other Algerian Associations involved in Astronomy and having Internet sites (or even not having), please let us know about you so that we can link together and let others know about you. A very short list of Algerian Astronomy Associations are listed at our Associations page. Our Association is some forty members strong. It has weekly lectures and workshops on every Thursday, and a Youth Club meeting every Monday afternoon some fifteen young members strong and growing. Our Association is also strongly involved in outreach programs to educational institutions in the area, on various aspects of the sciences in general, and Astronomy in particular. It also produces a fortnightly radio show on astronomy and the sciences on the local radio station Cirta FM (Kudos to Mourad, Karima, Mustapha, Khadija, Najat, and Afaf), and has a bulletin in Arabic (Sirius Voice ...of course) which is produced on a somewhat irregular basis (Financing problem!). A good sized article on Sirius appeared in the June 2000 issue of the renowed french astronomical magazine Eclipse with many more details on the activities of the Association.